Coffee cake was the fancy muffin of the Fifties. Housewives would make a bread-like cake with a cinnamon sugar/nut topping in their 9 x 13 pans and serve it with coffee at morning get-togethers in the neighborhood. 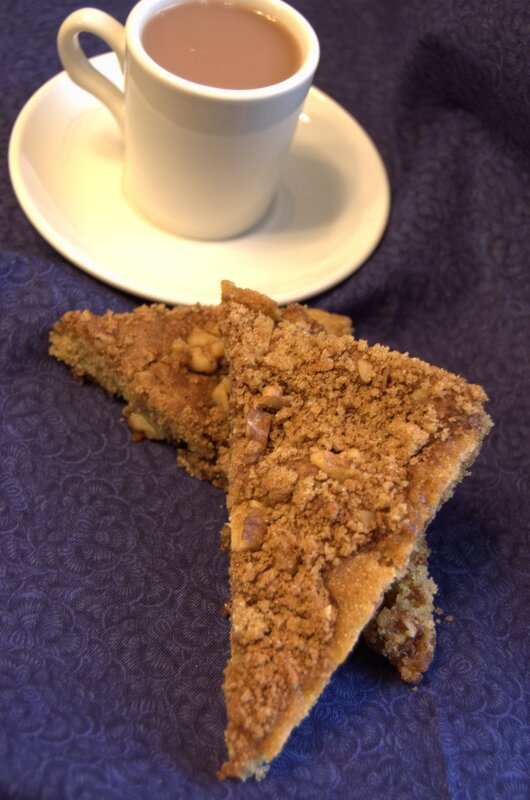 In the Eighties, the coffee cake morphed into huge, high-fat muffins and “housewife” became an unpolitically-correct term for “stay-at-home-mom.” I vote for the resurgence of the coffee cake, because it’s less trouble to make than fancy muffins and a serving is lower in fat and calories. This recipe can be put together at night and baked the next morning for breakfast. Combine topping ingredients and set aside. In mixing bowl, cream together butter and sugars until light and fluffy. Add eggs, one at a time, beating well after each addition. Stir or sift flour, baking powder, baking soda, cinnamon and salt in separate bowl. Add dry ingredients to mixing bowl alternately with sour milk, beating well after each addition. The batter will be extremely smooth and light. Spread enough batter to cover bottom of a greased 9 x 13 baking pan. Sprinkle half the topping mixture over batter. Cover with remaining batter and top with remaining topping mixture. Cover and refrigerate eight hours or overnight. Bake at 350 degrees for 35 -40 minutes or until done, with sides pulled away from pan and knife inserted in center coming out clean. Let set for ten minutes before cutting in squares. 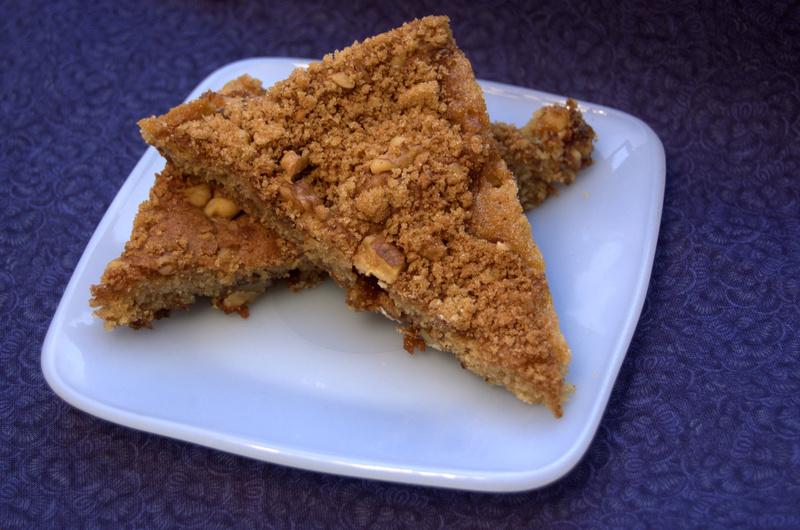 It is very crumbly and tender; lift out carefully with spatula onto individual plates. Serve warm. Serving suggestion: Have it for breakfast with scrambled eggs, hot cocoa and cut up fruit. This sounds good! Coffee cakes are delicious.